A nice collection of effects using a HERSHEY'S chocolate. 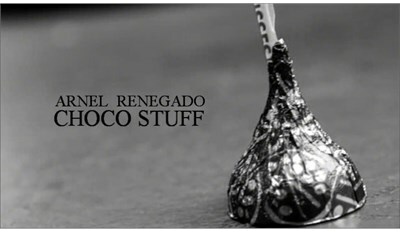 CHOCO STUFF: is a collection of effects using a HERSHEY'S chocolate. on this download Arnel teaches everything you need to perform this effect, with an EASY TO DO GIMMICK you can do all of this routine in a minute. COLOR AND FLAVOR CHANGE: With a snap you can make the chocolate change its color and flavor as well. HAUNTED CHOCO: Cause a chocolate to move by itself. UNWRAPPED: With a snap you cause a chocolate to unwrapped. TORN CHOCO: Spectator select a CARD and you rip the corner of it and then vanish, amazingly the corner is found visually inside the chocolate attached to the ribbon. CHOCO CRUST: Is one of our favorite to perform, one chocolate is held on spectators hand and then you slap it, the chocolate is now flatten and the chocolate vanish and found under your palm.SPECTATOR CAN FEEL THE CHOCOLATE INSIDE.END CLEAN. CHOCOIN: You borrow a coin and instantly you turn the coin into chocolate. TRANSPOSITION: An impossible transposition with two colored chocolate.Two chocolate is shown and spectator chose one of them,you then put it on their palm and with a snap you cause it to change places visually. A big thanks goes to Dan Hauss as one of the effects is inspired by an effect on his DVD RESTLESS.